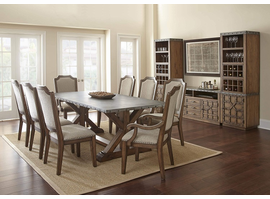 Steve Silver Furniture available through Z Modern Furniture Store In Alexandria Virginia. White Glove delivery available in Northern Virginia, Washington DC & Maryland. Please call Z Modern Furniture Store in Alexandria Virginia at 703-941-5042 to inquire about Steve Silver Furniture products. The combination of vision, capital and capacity at Steve Silver Company offer a powerful and compelling platform for growth for its customers, its suppliers and its employees. While continuing to be the low-cost category leader in casual dining, occasional and home office furniture, the company also will begin to focus on innovative and consumer-focused product development, a diversified licensed brand portfolio, optimization of its facilities and technologies through lean practices, strategic sourcing and value-added sales and marketing efforts.